Want to learn italian for free? Here are some flashcards and games, that will help you learn italian – while having fun! You can study by using the flashcards, and then test your knowledge by playing the corresponding games. Flashcards is a set of cards bearing information, as words or numbers, on either or both sides. Flashcards exercise the mental process of active recall. You can browse and “flip” the flashcards using buttons in order to learn italian. In addition, you can play the audio file to get the pronunciation. There is also a button that lets you select a random phrase. Flashcards are a great way to study! Hangman is a word-guessing game. 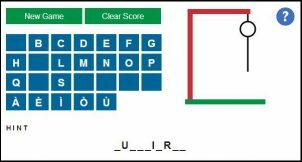 Start a new game to display the letters of the alphabet and a row of dashes indicating the number of letters to be guessed. In the hangman games, you click a letter to guess the word. If the letter is in the word, it replaces the dash(es). Each wrong guess results in a stroke being added to a gallows and its victim. Your job is to guess the word correctly before the victim meets his grisly fate. Do you want to learn italian in Italy? Learning italian in Italy is the best way to learn and understand the italian language and culture. The “Learn about Italy” website now cooperates with the italian I Love It School, which is an italian language school based in Orvieto – A historic city in the region of Umbria in Italy. Imagine a week in the picturesque city of Orvieto, staying with a local family, immersed in the culture, enjoying the food and wine of this ancient place. Stunning architecture, great food, local wine, and the chance to learn Italian in Italy, speaking the language all day, every day. Visit their website and read more about how you can speed up your italian learning!